After flying the Avro Ten, the Faith in Australia, from Sydney to New Plymouth on 3 - 4 December 1933, Charles Ulm and G.U. Allan made a "barnstorming" tour of New Zealand to raise funds and to publicise their case with the New Zealand Post Department for an official airmail on the return journey to Australia. 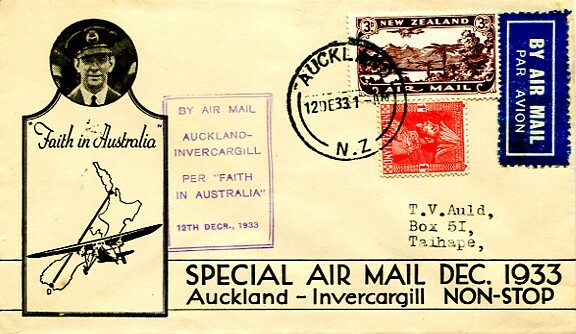 The tour included a non-stop official airmail flight from Auckland to Invercargill on December 12. The demonstration that a non-stop flight could be made from one end of New Zealand to another both helped his case for the trans-Tasman airmail and the case for regular internal airmail flights. The flight left Auckland at 4.30 am and arrived at Invercargill 8 hours later. 5,000 special covers were produced by the Vacuum Oil Company and show a picture of Ulm. There was a 3d airmail postage rate on top of the ordinary surface rate of 1d. A cachet was applied at Auckland and a backstamp on arrival at Invercargill. 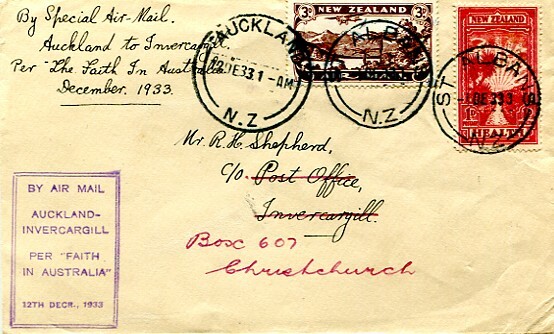 The second example was postmarked in St Albans on 1 December and then again in Auckland on 12 December. It is franked with the 1933 Health Stamp as well as the 3d airmail. Due to the volume, more than one backstamp was used in Invercargill as can be seen in the examples. The total carried was10,400 items.